The previous article in this series brought you the revelations the young Sathya unveiled to the lucky few. That He was Sai Baba, whose glory was known around Shirdi and the rest of Maharashtra if not Andhra Pradesh and that He Himself was installed in the sanctum sanctorum of the Temple of Virupaksha. He also demonstrated that with the loss of a gold collar pin, maya or illusion had gone! It was on 20 October 1940, the day after the group had returned from Hampi, that Sathya headed off to school but turned around midway and returned to His brother’s house in Uravakonda. As the caretaker of his younger brother, Seshama Raju was tremendously distressed and disappointed. But, from hindsight, we know that this little drama was a moment of great import for mankind. Sathya’s turning back from school marks a momentous turning in the cosmic order, beckoning untold Grace of which we are the recipients. As He stood outside the house, the sister-in-law took a look from the window. She was overwhelmed by the splendour of the halo around the boy’s head and shrieked! With those words, He left home and never set foot in the house again. To his brother Seshama Raju, He declared he was not related to him and instructed him to give up all attempts to cure Him. The Excise Inspector, Mr. Anjaneluyu, was an ardent devotee. Sathya went straight to the garden of his residence. His yard held a rock, which became the foundation on which Sai Baba sat and began His Work of transforming hearts. Word quickly spread about Sathya’s presence in the garden and soon a crowd gathered around the rock, some to worship, a few to mock, and many strictly out of curiosity. It was here on 20 October 1940 that the 14-year old Sathya declared His Avatarhood, and a significant new chapter was written into the saga of the Sai Avatar – one that generations would see as a turning point in the collective destiny of all humanity, nay for the entire universe, for we now realize the infinity of His glory. It was here that He taught his first sermon, a prayer that is so dear to millions and holds an eternal message for all aspiring souls. Samsara is the cycle of birth and death; the process of coming into existence as a differentiated, mortal creature over and over again until one is able to break this repeated rigmarole and merge back into the Infinite Source. Thus from the beginning, Sathya Sai Baba promised to lift us up and become our vehicle for a safe passage above the stormy waters that threaten to engulf us. A famous photograph from the period shows a garlanded young boy Sai Baba on the rock. In the foreground is a miniature Shirdi Sai Baba on whom too is a string of flowers while He is sitting in the characteristic pose. Mysteriously, the Saint of Shirdi appears only in the photo. People present at the time the picture was taken saw a crude rock, not Shirdi Sai. Making the garland of love. A Muslim boy, Abdul Ghafoor, was asked to sing the Prayer in Sathya’s absence, but it all ended with the singer, students and teachers in tears. Come to the throne they did when the school was dismissed for the day, and all the teachers and students flocked to where Baba was staying. But in order to bring about a change in their behaviour, Baba did not acknowledge His former students. Despite the new found detachment He showed for His family and school mates, Baba consented to letting His parents take Him to Puttaparthi - but only after they promised not to interfere with His task of meeting devotees. Nobody knew about Sai Baba in those days. When I returned to Puttaparthi from Uravakonda after My annunciation, the villagers heard the name ‘Sai Baba’ for the first time. They then thought that I had taken a Muslim name. But, Sai Baba transcends religion and caste. Wherever you see, there you will find Him. The dropping of the collar pin, leaving the school forever and the parents requesting Me to come back to Puttaparthi—these are all reasons that prompted Me to come away from Uravakonda permanently. Since then, My glory has been increasing day by day. People from neighbouring villages started coming to Puttaparthi in large numbers in bullock carts to seek remedies for various types of mental diseases, including those possessed by devils and ghosts. They regarded Me with great faith and would say, ‘It seems the devils and ghosts would leave if the boy orders them so.’ True to their faith, the moment such ‘patients’ were brought into My presence, they were relieved of devils and ghosts. On witnessing this miracle, several people believed My words to be true. Thus, Bhagavan’s lifelong mission to bring about healing had taken root. After staying first in His parents’ house and then in the home of Mother Easwaramma’s brother, Sathya Sai eventually settled at the house of Subbamma. She was the pious wife of the local village official, and played the role of Sathya’s surrogate mother since His childhood. 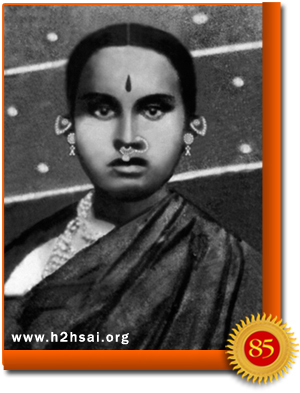 Hers was a vegetarian household and Mother Easwaramma always appreciated Subbamma’s concern for Sathya. Subbamma had no children of her own but since His birth, Sathya was dearer to her than life itself. Her home was large enough to accommodate the ever-growing flood of devotees. Since Baba insisted on feeding all who came to see Him, huge dining areas became necessary. Soon her family raised a shed and tent. Whenever the food cooked was not enough to feed the whole crowd, an eyewitness has said that Baba would be quietly notified. He would then ask for two coconuts, break them and sprinkle the water on the heaps of rice and vessels of prepared dishes. The food thus sanctified would last until dusk. At times Baba would wander off, even through locked doors, much to the consternation and worry of His devotees. They would search hither and yon until they found their Belovéd in some place of nature’s solitude: a cave, a grove, a riverbank, or perched atop a rock overlooking the valley. For instance, on one occasion He quietly excused Himself from a bullock cart procession when a mysterious young woman appeared to the assemblage, weeping and asking for a lift to the hospital to see her husband. When it was discovered Sathya Sai was lost, a search ensued and He appeared, but only when the young woman went missing. Since Baba knew the whereabouts of every lost person, they asked Him where the young woman had gone. To their utter surprise and shock, He appeared before them as the young woman - quite a punch line to His practical joke! 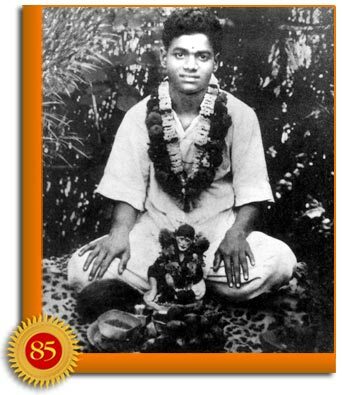 In spite of His merriment and miracles, there were some who harboured ill will towards the young Sathya Sai Baba. They even went to extreme measures to test Him. One woman in the neighbourhood beckoned Him away from Subbamma for a breakfast of poisoned food. Knowing what was coming, Baba ate her lethal vadas with relish. His blood became toxic and body turned blue. When concerned neighbours, suspicious of the woman’s intentions, arrived on the scene, Baba calmly asked for a glass of water. When He touched the tumbler, the water became blue and Baba recovered. 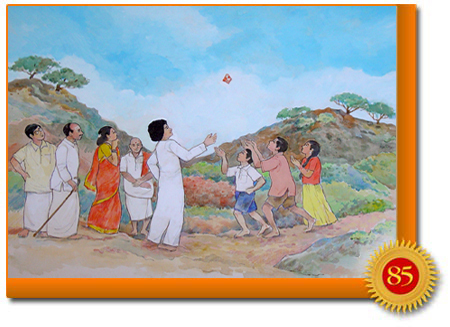 Ever a teacher of right action, Sathya Sai refused to let the family members retaliate. In a few seconds, there was a downpour but only on the burning structure. All else remained dry. The rain put out the fire. Once again, Sai Baba simply demonstrated a spirit of forgiveness and mercy to the men who had committed the deed. With tears of remorse in their eyes, the repentant men carried the young Baba on their shoulders.